A quick post to share a recent review of Interspecies (The Inlari Sagas). We were fortunate enough to receive a glowing review from the multi-award winning author, Lee Murray for SQ Mag. “The final story in the collection is Babylon’s Song by Woelf Dietrich. Ironically, the only New Zealand author in the group begins and ends his story in Australia’s New South Wales, where nine-year-old Samantha is forced to watch the slaughter of her parents outside their family home. Transported to New Zealand as a human slave for the inlari, Samantha is bonded to the kindly Master Zocht, but her sister, Kimberly, hasn’t been so lucky. My intent was never to write a lyrical masterpiece but a gritty story grounded in reality, albeit a science fiction one. And I think it worked. It’s funny, really, if you think about how I originally wrote a military sci-fi in “The Last Devil,” aiming for speed and action, and ended up with a sober story about survival. I’m proud of this tale because it features a major character from “The Last Devil” and it explores her childhood. On a whole, reviews thus far have been excellent, praising our stories for their seamless intersection against a shared universe, and generally fawning over the quality of our stories. This is good. Very good. We’re already busy planning the next volume and I can promise you awesome things for the future. 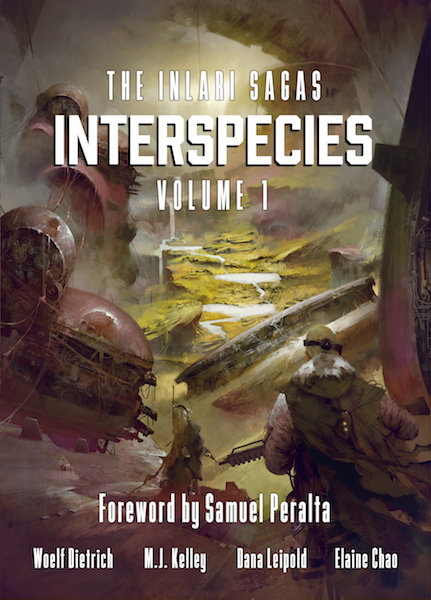 The print version of Interspecies (The Inlari Sagas) should be available by the end of this month and from what I’ve seen it looks gorgeous. So make sure to watch this space for more in the coming weeks. Chat to you soon, folks. Bravo and well done! The only disappointment about your story in the anthology was that there wasn’t more. 😉 Babylon’s Song had me riveted. I was curious to know what your inspiration was for it. I was reminded of Schindler’s List and The White Mountains series. I’m a counter-trafficking advocate so I’m very thankful that you put so much thoughtful work into your tale. Sans the aliens and electric shock collars, too many people experience today what your characters did. I’m writing my own novel (a dystopian hard sci-fi/space opera/military thriller with a human trafficking thread) and I’ll be holding your work up as a standard by which to measure success. BTW, I used to write with Elaine Chao in the collaborative online Star Trek fanfic club alt.starfleet.rpg, so I naturally jumped to buy a copy once I knew she had published. I’ve always held her writing skills in awe and am glad to see her working alongside people who are every bit as talented. Thanks again for the memorable story! I left a well deserved 5 star review at Amazon (under ecualegacy). Thanks, Brian. That is kind of you to say. With this story I wanted to explore the emotional ramifications of slavery, loss, pain, and a host of other things. I wanted to show how these factors would shape a person growing into adulthood. Like love, hate comes from the same place and can be equally powerful. As for modern day slavery, it’s in the top five things I abhor. Researching some of it becomes emotional and leaves a bitter taste. Elaine is awesome and I loved working with her and look forward to the future volumes of this series. Good luck with your novel. It sounds really interesting.